There has been an ongoing research effort by Yves Couder at CNRS University in France and John Bush an Applied Mathematician at MIT in the USA using fluid mechanics as an analogue to look at the de Broglie-Bohm interpretation of Quantum Mechanics. It originated by chance when observing the movement of oil droplets on a vibrating water bath. I have found some more really cool visualisers of Phylogeny - The tree of life which uses cladistics or clades. Find a way to incorporate all of these into the front end. Compare data sources - are they the same? The latest QCon weekly newsletter has a great article on the reasons to upgrade from Java 8 to 12 and the changes to Java support announced by Oracle. There is a great doc here which discusses OpenJDK etc. A panel discussion recorded April 9 at QCon London 2019, with video, slides and transcript. The panelists talk about costs, freedom of use, who governs Java/OpenJDK and what providers are for Java infrastructure for the next 5, 10, 15 years. The clearest explanations I've heard. Develop on Java 12 OpenJDK. 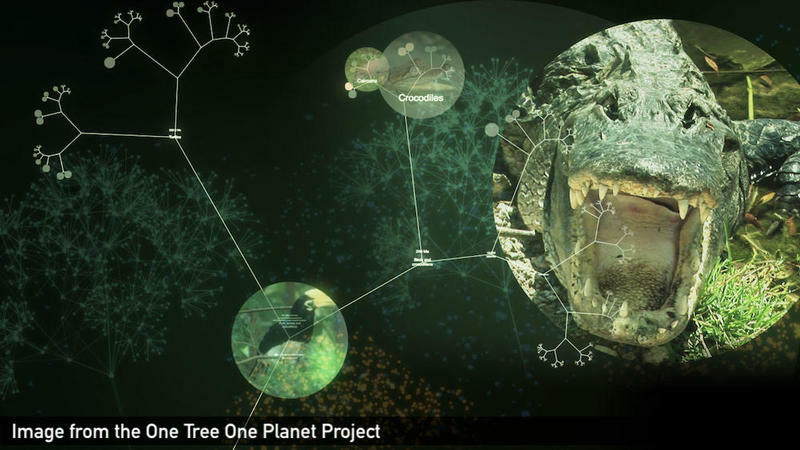 OneZoom has to be one of the coolest visualisations of the tree of life. It is an interactive map of the evolutionary relationships between over two million species of life on our planet. There is a great interview with co-creator James Rosindell in the Complexity Explorer newsletter. Adobe has been opening up their platform to integration with open API's. The API is the primary interface into Experience Platform. All Platform functions, including administrative functions, are available via API. Platform services, Adobe solutions, and 3rd party integrations use the same API. Guided by these principles, Adobe Experience Platform services and solutions are designed by first looking at the API and ensuring the functionality exists to support developers through low-level CRUD operations. Only once the API is built can the user interface (UI) be constructed by making REST calls to the API. By starting with the API, Experience Platform allows not only Adobe developers but any developer to have the same access to the core logic of Platform services and solutions by means of the same API calls. This principle is not limited to REST-based APIs. It also applies to other interfaces into Experience Platform like message-based, event-driven interfaces that allow developers to build responsive, reactive applications. Here is a Jupyter nbviewer of the Sound of Hydrogen which is taken from a blog post on the Jupyter web site. Just experimenting and having fun. I'm playing with a Jupyter nbviewer of iJulia programming language. It's a cool way to share a Jupyter Notebook. Project Jupyter: From Computational Notebooks to Large Scale Data Science with Sensitive Data with Brian Granger. ... from ACM July 2018. Brian Granger is an Associate Professor of Physics and Data Science at Cal Poly State University in San Luis Obispo, CA. USA. "Project Jupyter is an open-source project that exists to develop software, open standards, and services for interactive and reproducible computing. The main application developed by the project is the Jupyter Notebook, a web-application that allows users to create documents that combine live code with narrative text, mathematical equations, and visualizations. Since its creation in 2011, the Jupyter Notebook has become a widely-used, open standard for developing, sharing, communicating, and reproducing computational work in scientific computing and data science. In this talk I will give an overview of Project Jupyter and its open-source software and open standards for interactive and exploratory computing. Examples of its usage across a broad range of industries, disciplines and organizations will be used to illustrate the main ideas upon which Jupyter is founded. I will end by sketching our current work on JupyterLab, JupyterHub, and Binder and show how it is leading to 1) new challenges with large scale data science within complex organizations and 2) legal, ethical and technical questions regarding sensitive data." "The Event Horizon Telescope (EHT) is a project to create a large telescope array consisting of a global network of radio telescopes and combining data from several very-long-baseline interferometry (VLBI) stations around the Earth. The aim is to observe the immediate environment of the supermassive black hole Sagittarius A at the center of the Milky Way, as well as the even larger black hole in the center of the supergiant elliptical galaxy Messier 87, with angular resolution comparable to the black hole's event horizon." On April 10 at 9 am ET, the Event Horizon Telescope (EHT) collaboration will announce a “groundbreaking result” regarding black holes. Shep Doeleman, EHT Director, Center for Astrophysics, Harvard & Smithsonian. Dan Marrone, Associate Professor of Astronomy, University of Arizona. Following the announcement, at 11 am ET, black hole experts will explore the implications of the findings during “Expanding Horizons,” a live panel discussion at Perimeter Institute. At Last, a Black Hole's Image Revealed by Lee Billings, published in Scientific American April 10. "Analyses of the image - published in a series of six papers in the Astrophysical Journal Letters - confirm that within the limits of the EHT’s present sensitivity the shape and behavior of M87’s black hole fits Einstein’s predictions." What the Sight of a Black Hole Means to a Black Hole Physicist written by astrophysicist Janna Levin, published in Quanta April 10. Astronomers Capture First Image of a Black Hole published on the European Space Organisation (ESO) website April 10. Earth Sees First Image Of A Black Hole at NPR April 10. Outstanding science in my opinion. 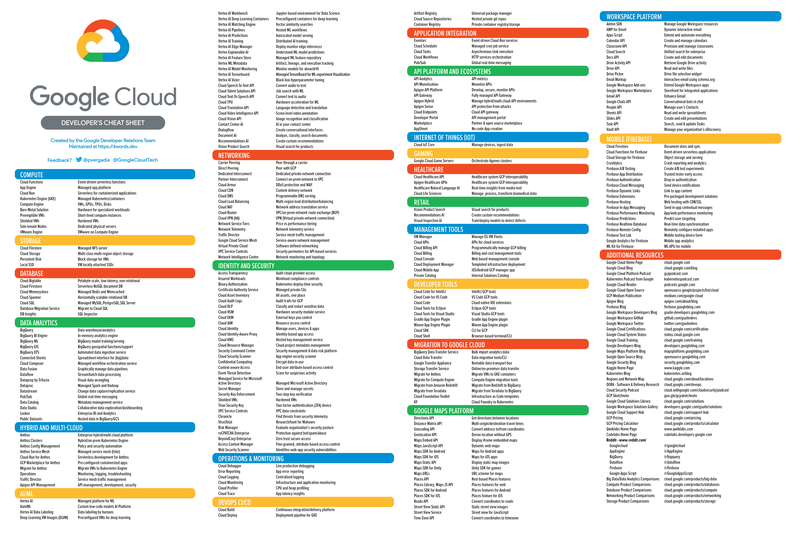 The Google Cloud Developers Cheat Sheet by the Google Developer Relations Team can be found at GitHub. "A list of every product in the Google Cloud family described in 4 words or less". There is a ton of stuff available with direct links to the products, documentation etc.